SAINT-QUENTIN-EN-YVELINES, France -- Nearly a century ago, Robert Marchand was told by a coach that he should give up cycling because he would never achieve anything on a bike. "I'm now waiting for a rival," he said. "I did not see the sign warning me I had 10 minutes left," Marchand said after his effort. "Otherwise I would have gone faster, I would have posted a better time. I'm not tired. I thought my legs would hurt, but they don't. My arms hurt, you have to hurt somewhere." 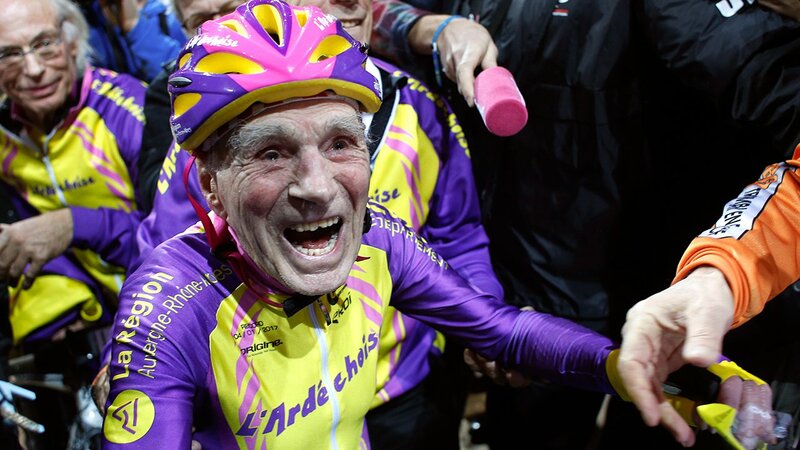 French cyclist Robert Marchand, aged 105, cycles in a bid to beat his record for distance cycled in one hour, at the velodrome of Saint-Quentin en Yvelines, outside Paris. Still, impressed fans and chanted "Robert, Robert" during the last minutes of his ride. Marchand received a standing ovation once he completed the last of his 92 laps and was then mobbed by dozens of cameramen and TV crews. "He could have been faster but he made a big mistake. He has stopped eating meat over the past month after being shocked by recent reports on how animals are subjected to cruel treatment," Marchand's physiologist, Veronique Billat, told The Associated Press. "He's got two essential qualities. A big heart that pumps a lot of blood, and he can reach high heart beat values that are exceptional for his age," said Billat, a university professor. "If he starts eating meat again and builds more muscle, he can better this mark." "If the president of his teenage club who told him he was not made for cycling because he was too small could see him today, he would kick himself," Marchand's coach and good friend Gerard Mistler told the AP. "He never pushed his limits, goes to bed at 9 p.m. and wakes up at 6 a.m., there's no other secret," Mistler said. "If had been doping, he would not be there anymore." "One needs to keep his muscles working," said Marchand, a faithful reader of communist newspaper L'Humanite. "Reading a lot keeps his mind alert," Mistler said. "He does not watch much TV, apart from the Tour de France stages." "Setting goals for himself is part of his personality," Mistler said. "If he tells me he wants to improve his record, I'll be game. Robert is a great example for all of us."